I admit I am mixed. There are a few touching emotional moments especially at the end where Jane convinces Volstagg to give up Ultimate Mjolnir upon realizing how ugly he has become. It is said to see kindly Volstagg has become a raging monster. The artwork is quite beautiful and the are a few badass scenes such as Jane holding both Mjolnirs or War Thor unleashing his power. Yeah. Jane holding both hammers was an effective splash. (No doubt, prime-Mjolnir was tempering the control of alt-Mjolnir but maybe they should have stated instead of implied that.) Great cover too. I can't help but get the feeling that for all the build up of this being a "War is Hell" storyline it is going to end with Jane doing an heroic sacrifice that miraculously ends the war without any of the heroes having to get their hands dirty. 1. 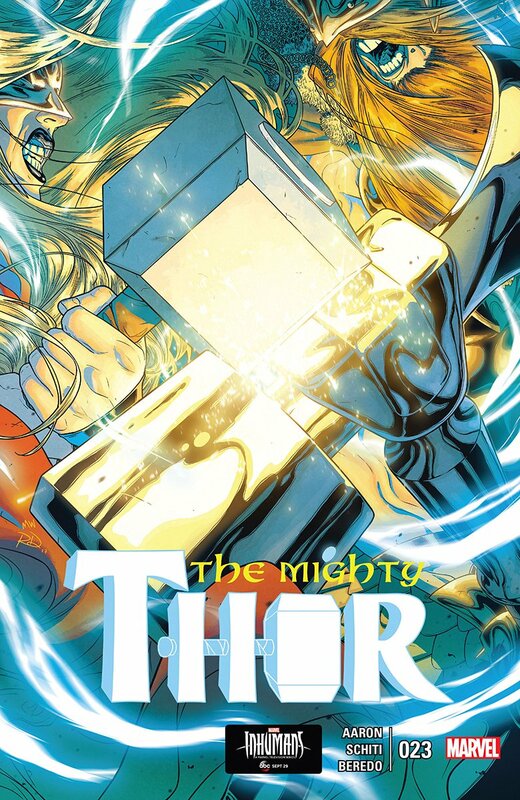 War Thor claims Ultimate Mjolnir is a "warhammer" unlike the true Mjolnir. What is he talking about? I thought Mjolnir had always been a war hammer? 2. When did Balder become king of Helheim? 3. How does Thor attach Jarlbjorn to his back to carry it? Eh, overall I give the issue about a 6.5 out of 10. 1. Did anyone else find the segue from frail Jane Foster confronting War Thor, unarmed and begin to talk him down from his ragequest, to suddenly warhammer discarded and Volstagg crying on her shoulder - a story scene fail and missed opp for a needed dramatic scene? 2. Uhh, where was Janethor throwing the alt-Mjolnir away to? 3. Kudos for Thor for telling readers where - but why did he blindly send to the dimension of Asgard and how would that be an ideal place to merely dump this incredible artifact in an MU where the mere knowledge of the location of say, an Infinity Stone is could start cosmic chaos? Also, this whole time readers have been on edge of seats to see if/when he (could) lift it and all we see him (have to) do is shout a command to the warhammer? Hmmph.